Iris is the girl who Ash meets while in Unova. 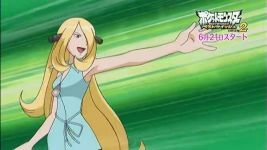 Iris is based on the eighth gym leader of Unova in Pokémon Black & White. Her goal is yet unknown but she appears to be a wild child and has been seen swinging from vines in forests in order to get from place to place. Iris, like Ash & Dawn, has her partner Pokémon stay out of its Pokéball on most occasions. Her partner Pokémon being Axew, the Tusk Pokémon. However, despite the fact it doesn't go into its Pokéball, Axew does jump into Iris' hair whenever Iris decides to actively go somewhere. 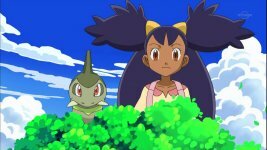 Ash and Iris will meet Cilan at the Striaton City Gym. Like in the games, Cilan is the Gym Leader there. Cilan will join Ash & Iris on their journey. 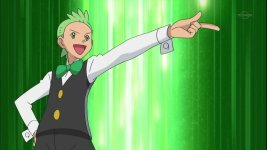 Cilan is not just a Gym Leader with battling skills, but he is described as a Pokémon Sommelier and has the ability to see the compatibility between Pokémon and their trainers. In addition to this, there are numerous new characters who will recur throughout the series. As Unova is far away, familiar characters from previous sagas will be few and far between so the new characters are to be seen more often. Even Nurse Joy & Officer Jenny have been replaced by new characters. Professor Juniper (アララギ博士) is the Professor in the region, and like in the games, she offers Snivy, Tepig & Oshawott to prospective trainers. Trip (シューティ)is a trainer in Unova. Wanting to take on the Unova League, Trip travels around Unova to get the badges. In addition to that, he has a hobby as a Pokémon photographer and takes photos of Pokémon he hasn't previously seen. 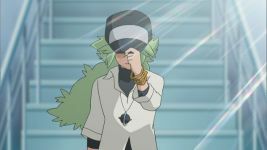 Don George (ドン・ジョージ)is the leader of the Pokémon Battle Club in Unova. He teaches trainers new moves and allows trainers to battle freely there. Later in the series, Best Wishes gets its renewal classed for the first time as Series 2. This part of the saga takes place in East Unova and has Ash, Iris & Cilan travel there with Cynthia to learn of the Pokémon World Tournament - Junior Cup which is taking place there. East Unova is filled with Pokémon not native to Unova. Several characters start to recur during the series.